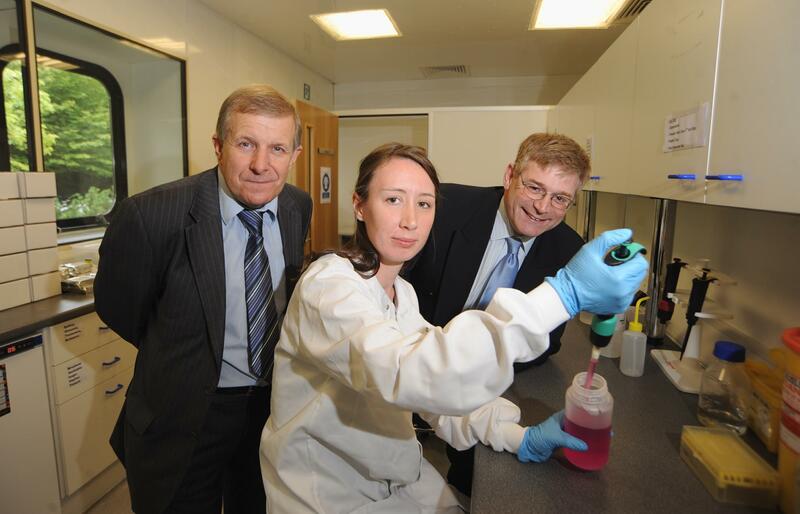 Pictured, left to right, is Mike Holden, chairman of Global Forensics, Sarah Bailey, lead forensic scientist at Global Forensics, and David Grindrod, acting director of the University of Warwick Science Park. A human identification test which will revolutionise forensic science worldwide by “solving crimes quicker” has been launched in the region for a world market. The cutting-edge technology can determine in less than two hours which suspects and evidence should be DNA tested, saving invaluable police investigation time, effort and money. The DNA screening tool or stand-a-lone system has been launched by Global Forensics based at the University of Warwick Science Park’s recently opened LabStart facility. The site in Sir William Lyons Road is dedicated to helping businesses develop innovative products by providing laboratory and office space. Instead of using DNA, the test, known as AbP•ID®, reads the unique autoantibodies found in human body fluids to establish whether the profile of evidence at a crime scene matches the profile of a suspect. By revealing the unique antibody profile, it can identify which evidence warrants being DNA tested or in countries with no DNA capability it can be used on its own with its own software and database. The test has been validated and is now being marketed and distributed in the UK and overseas by Global Forensics, following its development by Identity Sciences, a high-tech forensic company in the USA. Mike Holden, chairman of Global Forensics, said: “This human identification system is the next generation of forensic tools to be invented since fingerprinting in 1901 and forensic DNA introduced in 1994. Global Forensics was the first company to move onto LabStart, which offers a range of business support services as well as laboratory and office space to start-ups and pioneering companies. With its three sites, the University of Warwick Science Park also provides the potential for businesses to outgrow LabStart and relocate to bigger units within the complex. For more information on LabStart contact Karen Aston at the University of Warwick Science Park on 02476 323000. An AbP•ID® test reads special antibodies found in all mammals rather than analysing a chemical in a cell’s nucleus. The antibodies are called Individual Specific Autoantibodies (ISAs) and are different to the antibodies which fight off colds or flu, instead ridding the body of dead cells. The ISAs, however, are unique to every person from the age of two – even identical twins. Tests can be carried out locally from just a small amount of blood and a reliable ID test result can be discovered within two hours.